blog.equityapartments.com » Introducing New Features for our Mobile App – Download Today! 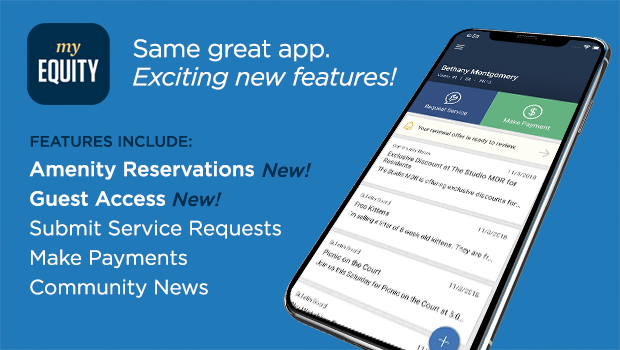 Introducing New Features for our Mobile App – Download Today! Now with new features, we proudly present the My Equity app for both iOS and Android. Click below and download the app today! Staying connected has never been easier with features including the ability to make rent payments, submit service requests, interact with your neighbors and tune in to news around the community. We have also just introduced the ability to reserve amenities and handle guest access. Weâ€™ll be continuously exploring features and improvements to create the best possible experience. If you have any feedback or issues, we welcome you to reach out to us at feedback@eqr.com.